Oral health is of utmost importance in our lives, and having beautiful, healthy teeth and gums makes us more confident and charismatic. And Dr. Paul Campbell is entirely committed to rendering his patients the health and looks that they have always dreamed of. Having graduated the University of California at Los Angeles’s Dental School, Dr. Campbell has earned his Dental Surgeon degree in 1984. He has been practicing dentistry for 27 years now, having earned a strong reputation as a leading provider of dental and oral care in LA and the surrounding areas. Dr. Campbell operates in a state-of-the-art dental office where the highest standards of dental and oral care are met. The entire staff at his practice is highly trained, experienced and friendly, so that you will have a positive experience with us which will convince you to refer Dr. Campbell to your friends and family members, as well. 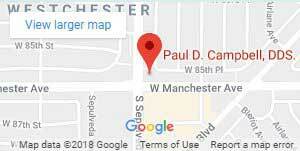 Our dental office is located at the corner of Manchester & Sepulveda Boulevard and we welcome patients from the entire area of Westchester. We also accept most dental insurance types. For any issues concerning your teeth, gums, and mouth, we kindly invite you to contact us in order to schedule a consultation with Dr. Campbell.